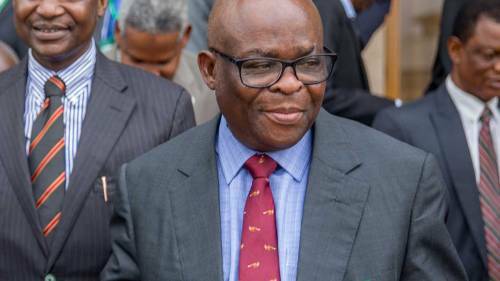 The Chief Justice of Nigeria, Walter Onnoghen, has been granted bail on self-recognition by the Code of Conduct Tribunal. The case was adjourned to March 11, for a hearing of all pending applications. Onneghen was granted bail after he pleaded not guilty to the six count-charge preferred against him by the Federal Government of Nigeria. The six count-charge were subsumed that aside allegation that he failed to disclose his assets as prescribed by law, FG, in the charge that was filed by the Code of Conduct Bureau, CCB, equally accused the CJN of operating foreign bank accounts. It also alleged that contrary to relevant laws regulating the conduct of public office holders, the CJN, maintained a domiciliary foreign currencies account that comprised use of Dollars Account, Pound Sterling Account and Euro Account. Onneghen’s defence counsel, Chris Uche, pleaded that the warrant of arrest slammed against the CJN be vacated. “We are here for the arraignment but before the tribunal proceeds, it will be recalled that there are applications pending. “It was the view by way of the majority decision of this tribunal that the defendant must appear. “And here is the defendant. But may I plead that the order of the bench warrant is discharged before proceedings “. The chairman of the tribunal, Danladi Umar conveyed approval but stated that it’s on the condition that he will make himself available in the next hearing. Uche also applied for an adjournment over which the prosecuting counsel, Musa Ibrahim did not object. On this premise, the tribunal chairman acceded to the application and adjourned the case to March 11, for a hearing of all pending applications.